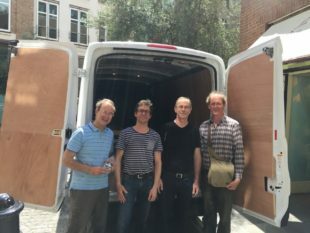 During the International Society of Organ builders congress in London, we collected the Snetzler bureau organ given from the estate of Ellie Warburg to the Handel House Museum in Brook Street Westminster. We were assisted by our former colleague Peter Meier who has a successful firm in Rheinfelden Switzerland http://petermeierorgelbau.com/ and his colleague Marco Venegoni who makes metal pipes in Vilmergen Switzerland. They were at the Congress and not expecting to be doing any work.